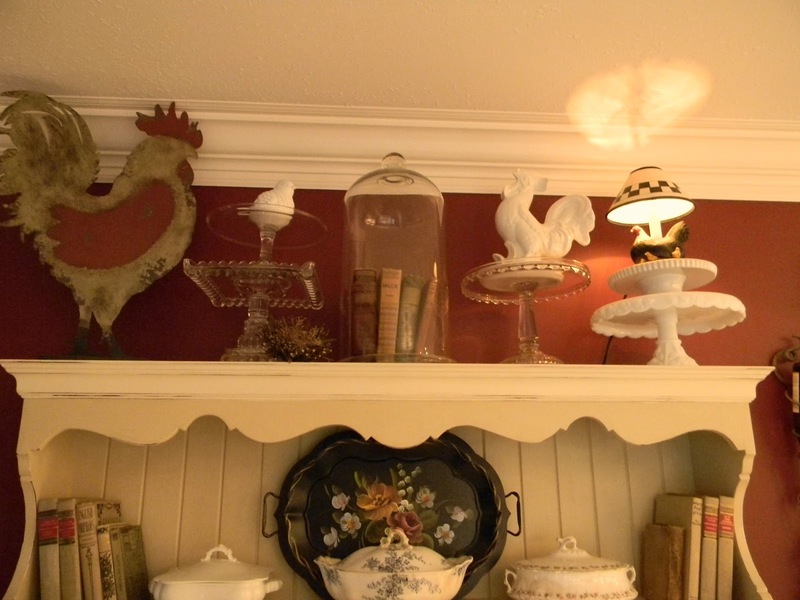 Before I show you how I have my hutch displayed currently, let's go down memory lane...shall we? First came the hutch, found at a thrift store. Then I painted it to lighten and freshen it up. I fell in love! I used Annie Sloan Old White and Old Ochre Chalk Paint. Now we are up-to-date with the different looks of my hutch and I hope that you are not bored yet. 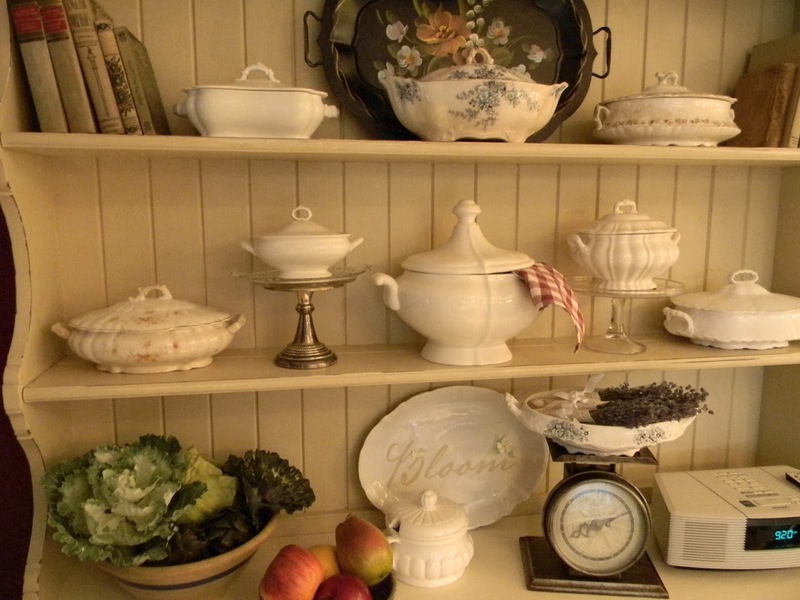 Now for a closer view of my tureens...most caught my eye at garage sales. I recently found the vintage postal scale at a garage sale and thought that it had great patina and history. Lastly, I gathered my collection of pedestal cake plates and stacked them on top. The hutch looks great. 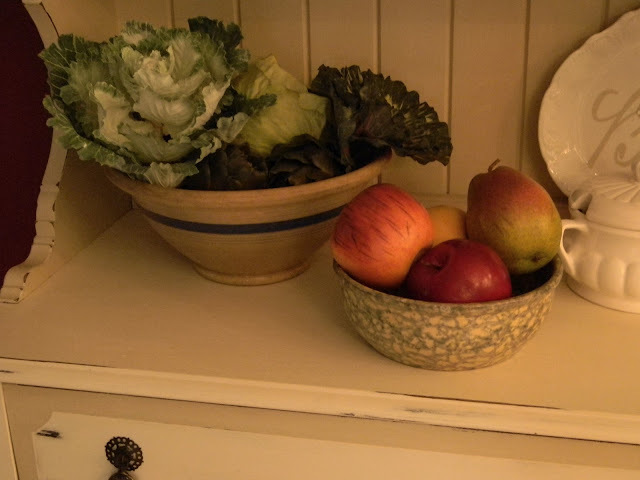 I love soup tureens and have a collection myself. Have a great day! What a GORGEOUS job! I just keep hearing about ASP paint but unfortunately I dont have that kind of money so I make my own chalk paint with great success:)You certainly did a wonderful job on this piece. Nice stopping by your place and seeing your treasures. Great job!!! Looks like a fun piece of furniture to decorate! Can't even decide which I like best - they are all my favorites! 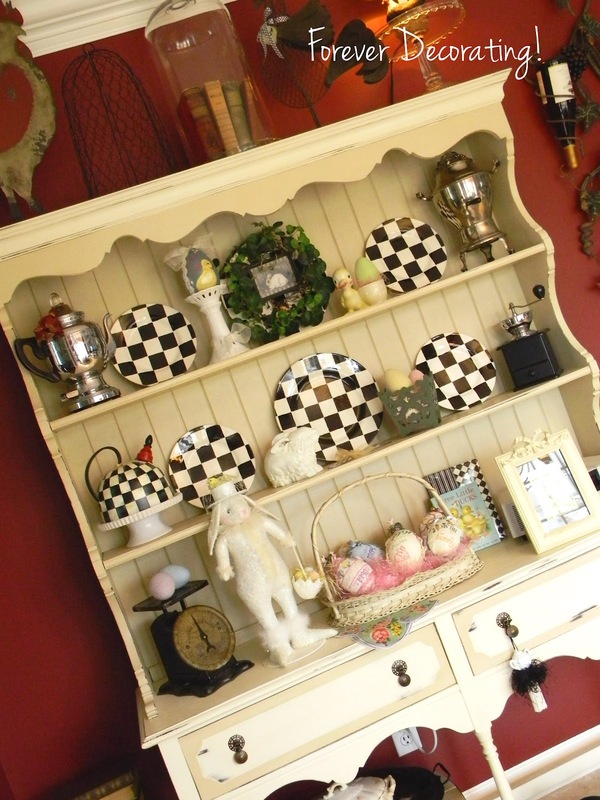 Wonderful job on your hutch. I can't pick a favorite and i tried, but I like them all so much. Ok, we have some of the same taste. 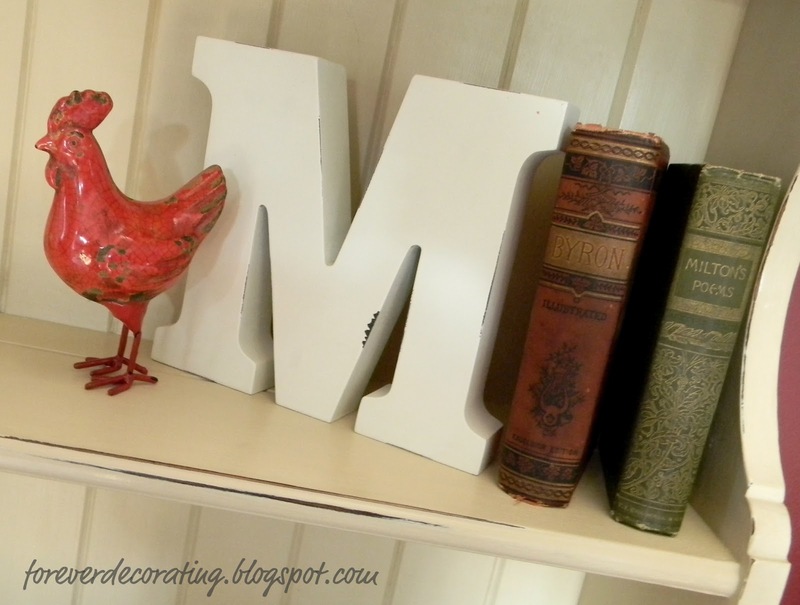 The big rooster on top of hutch, I have that too and the little red rooster by the letter M, have it too. Love the hutch too. 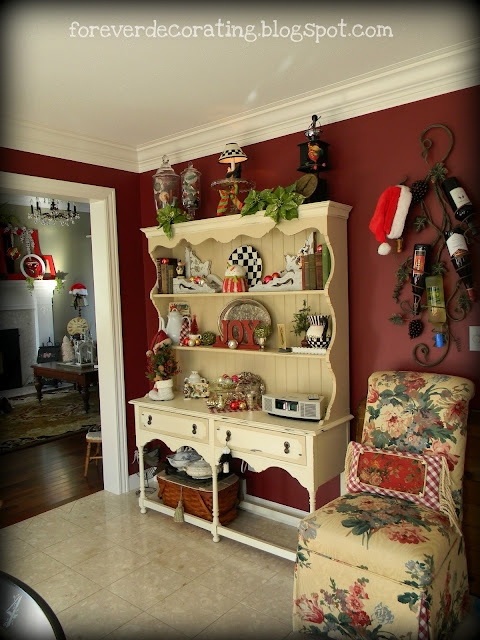 The hutch looks great - especially against that gorgeous red wall. I love all your tureens and the hutch is the perfect place for them. 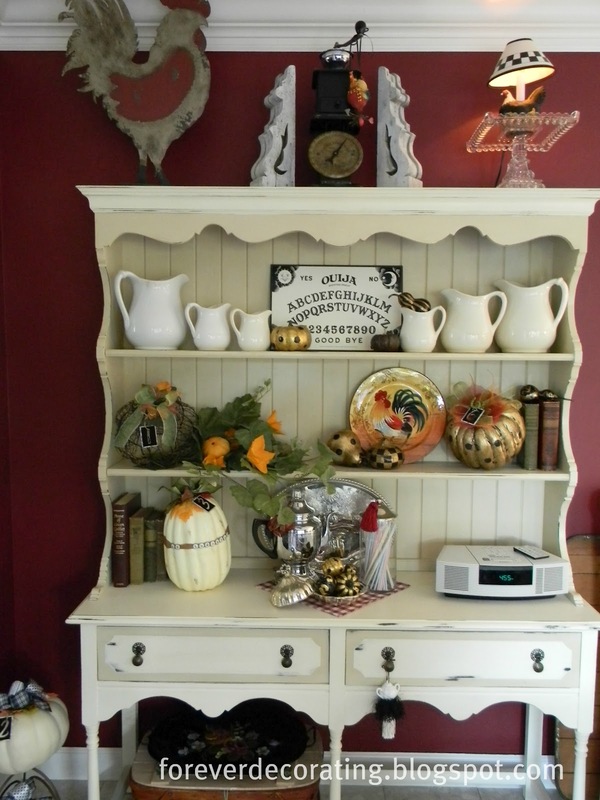 I love your hutch and I especially love how you change the contents to match the season. I'm feeling some hutch envy here! FUN post!! 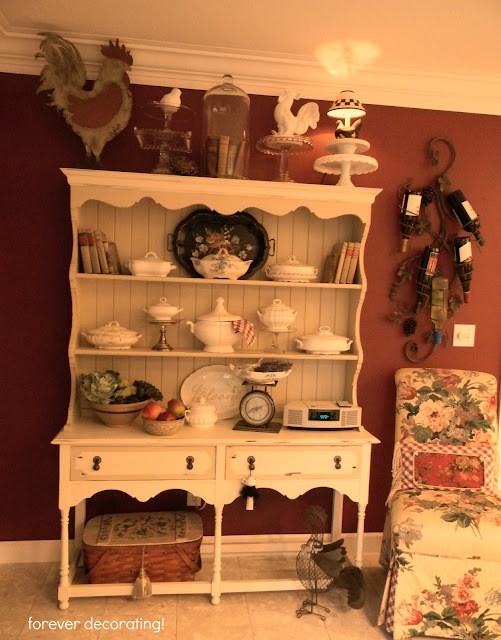 Love all of the ways you've used your hutch for display...but my fave is with the white ironstone...what a fun piece you've rescued! 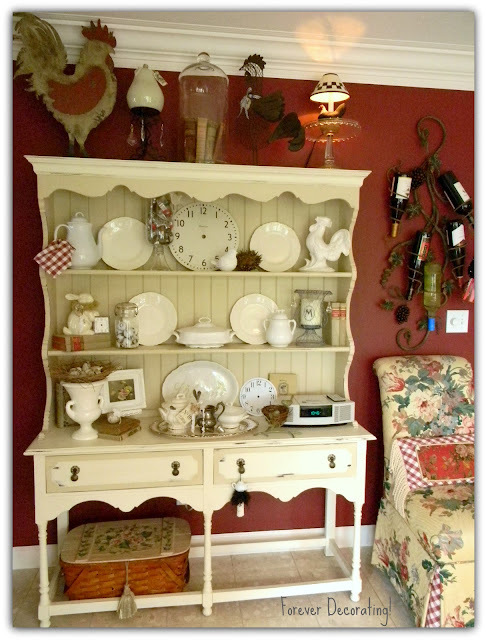 It's fun to see all the different "iterations" of your hutch! I think your current one may be my favorite! 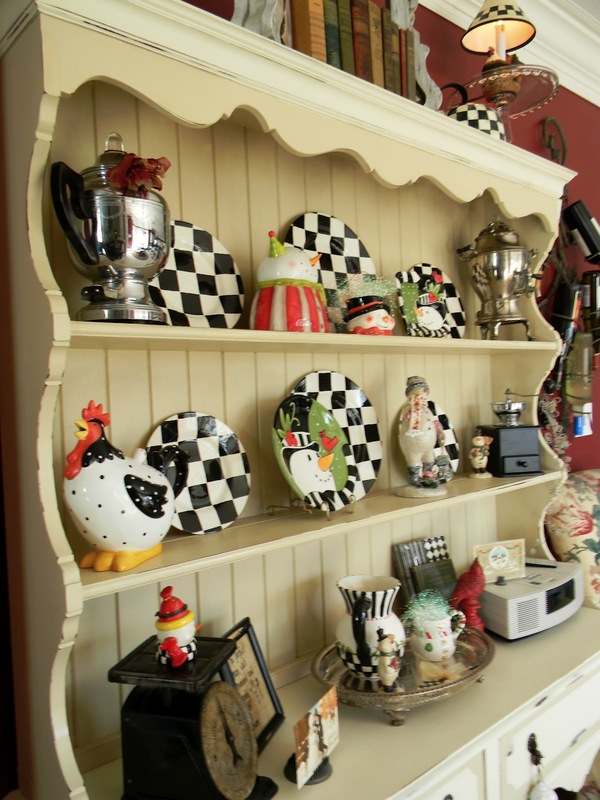 Great vignettes on your hutch!! 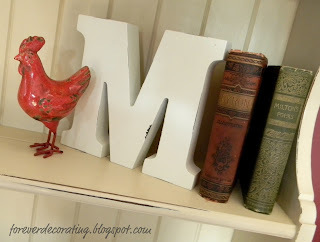 LOVE your cloche and books.And I also am in love with your ironstone tureens and pitchers! 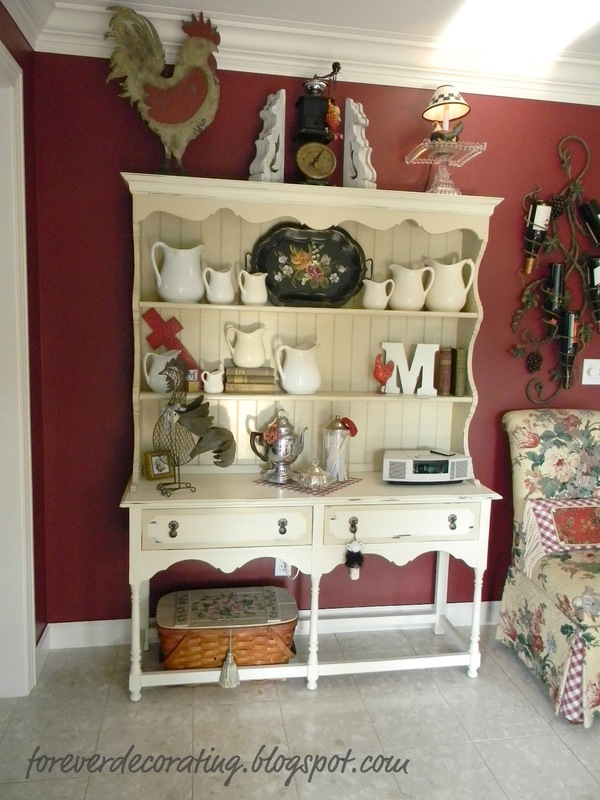 I love how your hutch turned out! I'm on the hunt for an old one that I can makeover. This is such a great piece. I too love having furniture that is so versatile for decorating. The white ironstone and your new scale are just wonderful there. 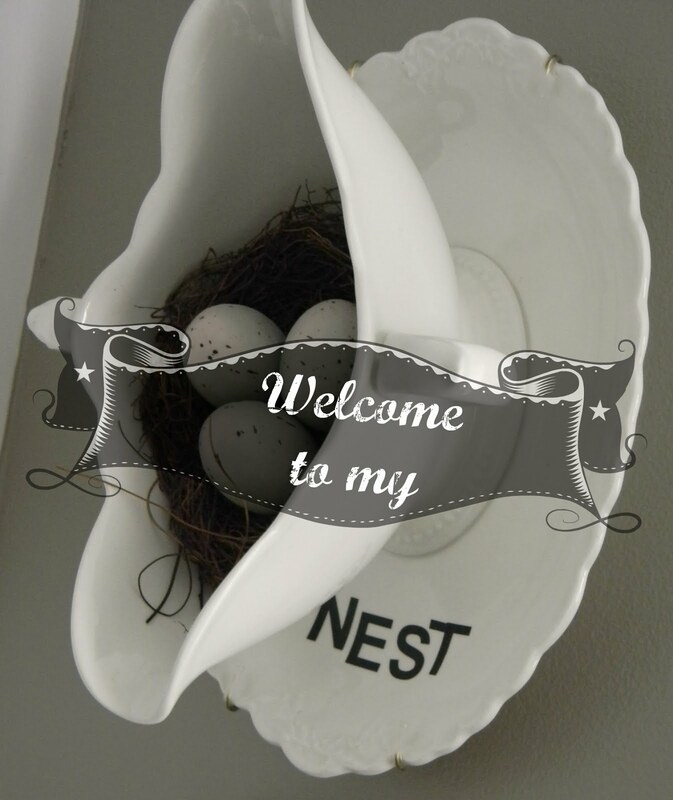 thanks so much for joining in for Vintage Inspiration! 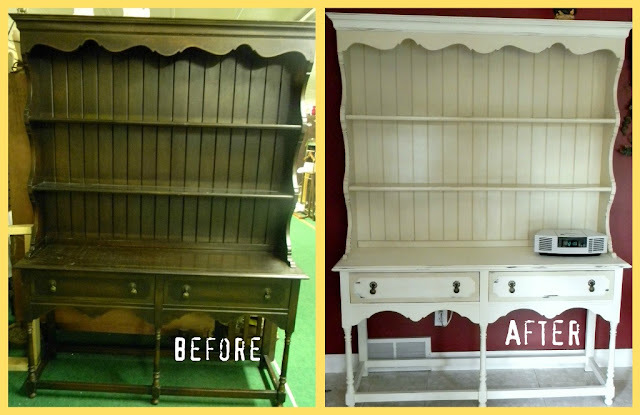 Your hutch is beautiful in all of it's different looks. 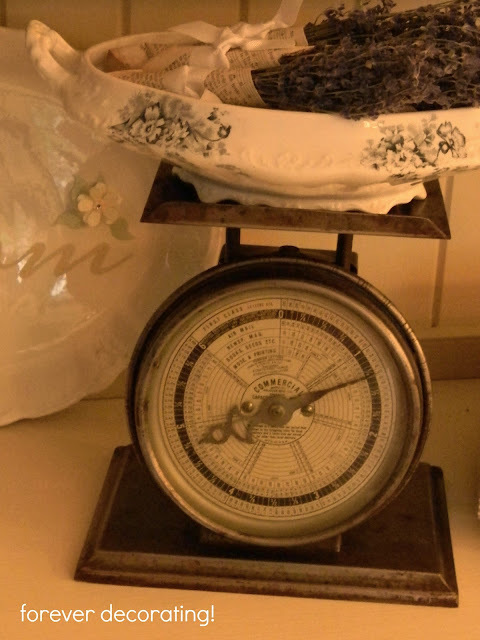 I really love that postal scale and since I have a tureen addiction I'm drooling over the beautiful ones that you have. What a beautiful hutch and you have so many wonderful collections! Your hutch is such a pretty starting point! And isn't it fun to mix it up! No more Dirty Little Secret!